How can cloud consumers ensure data is stored on a cloud storage device is physically located in a region that meets required compliance policies? Cloud consumer organizations may need to comply with regulatory data hosting policies that may place specific location requirements upon the storage devices used to host the data. However, when hosting data in a third-party cloud, there may be no way of knowing whether the cloud storage devices used meet these requirements. 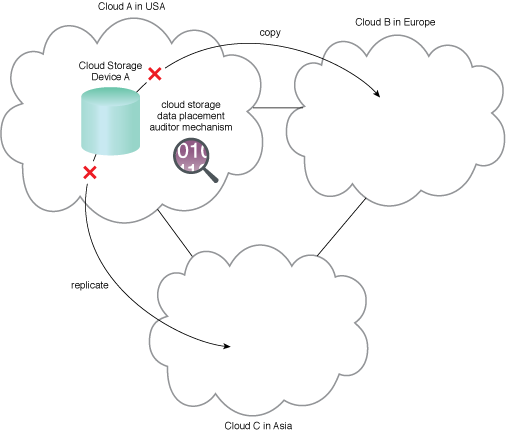 A solution is implemented to monitor the location of a cloud storage device and send notifications should the storage conditions no longer satisfy compliance policies. The cloud storage data placement auditor mechanism is used to enforce policies defined by the cloud consumer (or cloud provider) on a specific dataset or cloud storage device. The steps in applying the Cloud Storage Data Placement Compliance Check pattern are illustrated. A cloud storage data placement auditor mechanism monitors and enforces policies on Cloud Storage Device A.